باباگلی, جواد, علی اکبری بیدختی, عباسعلی, سلمانی قزوینی, زهرا. (1397). بررسی خواص فیزیکی و امواج بلند ساحلی خزر جنوبی. 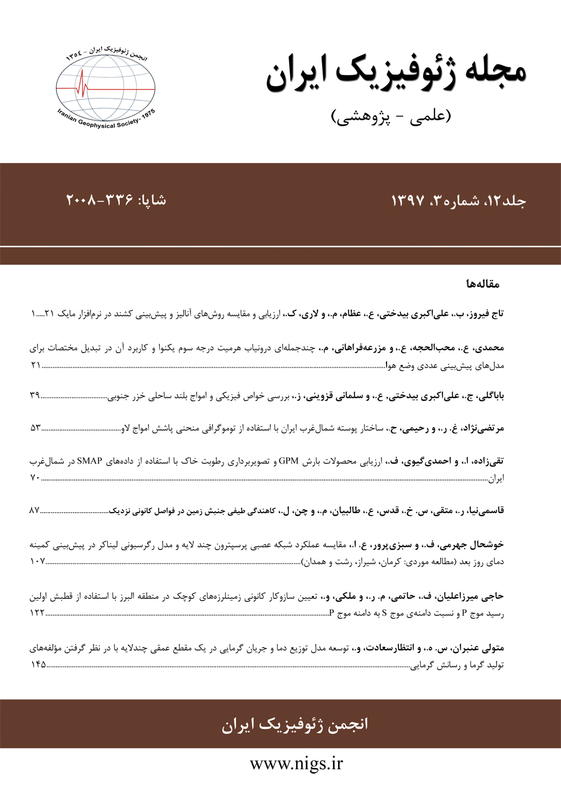 مجله ژئوفیزیک ایران, 12(3), 39-52. جواد باباگلی; عباسعلی علی اکبری بیدختی; زهرا سلمانی قزوینی. "بررسی خواص فیزیکی و امواج بلند ساحلی خزر جنوبی". مجله ژئوفیزیک ایران, 12, 3, 1397, 39-52. باباگلی, جواد, علی اکبری بیدختی, عباسعلی, سلمانی قزوینی, زهرا. (1397). 'بررسی خواص فیزیکی و امواج بلند ساحلی خزر جنوبی', مجله ژئوفیزیک ایران, 12(3), pp. 39-52. باباگلی, جواد, علی اکبری بیدختی, عباسعلی, سلمانی قزوینی, زهرا. بررسی خواص فیزیکی و امواج بلند ساحلی خزر جنوبی. مجله ژئوفیزیک ایران, 1397; 12(3): 39-52. این پژوهش به بررسی پارامترهای فیزیکی آب‌های حوزه خزر جنوبی و امکان رخداد امواج کلوین ساحلی در دریای خزر به‌کمک داده‌های ADCP، CTD، داده‌های هواشناسی، تراز سطحی و تصاویر ماهواره‌ای می‌پردازد. بررسی‌ها نشان می‌دهد بیشترین اثرپذیری ساختار چینه‌بندی حوزه جنوبی به‌دلیل تغییرات دمایی در این حوزه است و عامل شوری نقش کلیدی بازی نمی‌کند. ترموکلاین فصلی در حدود دو ماه از سال (بهمن و اسفند) در این حوزه ناپدید می‌شود و دوباره با گرم شدن هوا توسعه می‌یابد. داده‌های دستگاه سرعت‌سنجی نشان می‌دهد اندازه مؤلفه u سرعت بیشتر از مؤلفه v سرعت است و تا حدود دو برابر هم می‌رسد. منحنی چگالی طیفی سرعت‌سنج نشان می‌دهد که در این حوزه، بیشینه‌های چند ساعته تا چند روزه وجود دارند. در این پژوهش بیشینه­هایی با دوره‌های 30، 40، 48 و 60 ساعت جزء امواج کلوین محسوب می­شوند. در گام بعد، با بررسی داده‌های تراز سطحی، تصاویر ماهواره‌ای و داده‌های باد، دیده شد که بیشینه‌های گفته‌شده درباره امواج کلوین، در بیشینه‌های چگالی طیفی باد و تراز سطحی هم مشاهده می‌شوند. امواج کلوین دو مد باروتروپیکی و باروکلینیکی دارند ولی به‌احتمال‌زیاد، مد باروکلینیکی در این حوزه از اهمیت بیشتری برخوردار است. برای مد باروکلینیکی، شعاع تغییر شکل راسبی حدود 20 کیلومتر و سرعت گروه حدود 2/1 متر بر ثانیه تخمین زده شده است. شایان ذکر است که با توجه به این دوره‌ها، طول‌موج امواج در خزر جنوبی از 129 تا 259 کیلومتر متغیر بود که این موضوع با تصاویر ماهواره‌ای Aviso همخوانی نسبتاً خوبی دارد. The Caspian Sea, the world’s largest inland enclosed water body, consists of three basins namely northern, middle and southern. This study investigates physical oceanography properties and long waves in the southern Caspian Sea. To deal with this, we used ADCP, CTD, weather data, sea level and satellite imageries. The data were collected by National Institute of Oceanography and Atmospheric Sciences (ADCP and CTD), Port and Maritime Organization (sea level), and Meteorological Organization (wind data). The results show that the temperature plays pivotal role in the structure of water in this basin. The place of thermocline and pycnocline are about at the same depth and the thickness of mixed layer in the summer and fall are about 25 and 15 meters, respectively. The analyses of ADCP data show that thermocline disappears from February to March and after two months, the thermocline starts to develop. In most of cases, the magnitude of meridianal velocity is stronger than zonal speed based on ADCP data. Spectral density of time variations of velocities of current and wind show that there are many peaks from a few hours to many days. We consider some periods such as 30, 40, 48 and 60 hours as Kelvin waves based on our background information about these waves. Sea level data and satellite images (Aviso sensor) confirm the results in terms of periods and wavelengths. Due to barotropic and baroclinic modes of Kelvin waves, wavelengths, angular frequencies and group speeds are calculated separately. According to these results, baroclinic mode is more important than barotropic mode in this basin. Based on the governing equations of shallow water, the sea level gradient equation was written and time series of sea surface level changes were plotted. The results show that the long wave amplitudes are from 10 to 15 cm according to satellite and observation data. In this basin, the reduced gravity varies from 0.006 to 0.008 m/s2 in different seasons and the thickness of the denser water column is considered about 150-200 m. The Rossby radius of deformation and group velocity are 20 km and 1.2 m/s, respectively. Due to different periods of Kelvin waves, the wavelengths vary from 129 to 259 km. The satellite images confirm Kelvin waves because there are some anomalies in sea level similar to that produced by Kelvin waves with similar periods and wavelengths. Based on results, it is recommended that more detailed observational data should be collected in the deep parts of the southern and middle basins of the Caspian Sea. چابک‌سوار، ج.، ترابی آزاد، م.، 1376، مطالعه تغییرات پارامترهای فیزیکی و شیمیایی سواحل جنوبی دریای خزر: هشتمین گردهمایی ارگان‌های دریایی کشور و اولین کنفرانس نقش صنایع دریایی در صنعت حمل‌ونقل،27-26 تیرماه، نکا، 15-23. حاجی‌زاده ذاکر، ن.، غفاری نوران، پ.، ۱۳۸۵، ساختار حرارتی فلات قاره ساحل جنوبی دریای خزر در منطقه بابلسر در استان مازندران، ایران: هفتمین همایش بین‌المللی سواحل، بنادر و سازه‌های دریایی، تهران، سازمان بنادر و کشتی‌رانی، 200-209. علی‌اکبری بیدختی، ع. ع.، 1383، مبانی دینامیک شاره‌ها: انتشارات دانشگاه تهران، 1-285. شکرباغانی، ا.، علی‌اکبری‌بیدختی، ع. ع.، 1384، نقش امواج درونی در ایجاد ساختار لایه‌ای در جریان‌های تبادلی شناوری بین دو حوزه دریایی بسته (حوضچه‌های جنوبی و میانی خزر): مجله پژوهش فیزیک ایران، 5 (4)، 213-224. Babagoli, J., Bidokhti, A. A., and Shieh, M., 2017, Some aspects of the deep abyssal overflow between the middle and southern basins of the Caspian Sea: Ocean Science Discussions, doi: 10.5194/os-2016-87. Ferronsky, V. I., Brezgunov, V. S., Vlasova, L. S., Polyakov, V. A., Froehlich, K., and Rozansky, K., 2003, Investigation of water-exchange processes in the Caspian Sea on the basis of isotopic and oceanographic data: Water Resources, 30(1), 10-22. Ghaffari, P., Isachsen, P. E., and LaCasce, J. H., 2013, Topographic effects on current variability in the Caspian Sea, Journal of Geophysical Research: Oceans, 118(12), 7107-7116. Gill, A. E., 1982, Atmosphere–Ocean Dynamics: Academic Press, New York. Gunduz, M., 2014, Caspian Sea surface circulation variability inferred from satellite altimeter and sea surface temperature: Journal of Geophysical Research: Oceans, 119(2), 1420-1430. Gunduz, M., Özsoy, E., 2014, Modelling seasonal circulation and thermohaline structure of the Caspian Sea: Ocean Science, 11, 259–292. Kara, A. B., Wallcraft, A. J., Metzger, E. J., and Gunduz, M., 2010, Impacts of freshwater on the seasonal variations of surface salinity and circulation in the Caspian Sea: Continental Shelf Research, 30(10), 1211-1225. Kosarev, A. N., 2005, Physico-geographical conditions of the Caspian Sea, in The Caspian Sea Environment, Springer, Berlin, Heidelberg, 5-31. Litovchenko, K., and Ivanov, A., 2008, Monitoring of oil spills in the north Caspian sea using SAR imagery and multi-sensor satellite data, in IEEE International Geoscience and Remote Sensing Symposium, 2008, IGARSS 2008, 4, IV-605. Rodionov, S., 2012, Global and regional climate interaction: The Caspian Sea experience: 11, Springer Science and Business Media. Temimi, M., Romanov, P., Ghedira, H., Khanbilvardi, R., and Smith, K., 2011, Sea-ice monitoring over the Caspian Sea using geostationary satellite data: International Journal of Remote Sensing, 32(6), 1575-1593. Terziev, F. S., Kosarev, A., and Kerimov, A. A., 1992, The Hydrometeorology and Hydrochemistry of the USSR Seas, 6, The Caspian Sea, Issue 1, Hydrometeorological Conditions, Hydrometeoizdat, St. Petersburg, Russia. Tuzhilkin, V. S., and Kosarev, A. N., 2005, Thermohaline structure and general circulation of the Caspian Sea waters, in: Caspian Sea Environment, Springer-Verlag, Berlin, Heidelberg, Handbook of Environmental Chemistry. Vallis, G. K, 2006, Atmospheric and Oceanic Fluid Dynamics: Cambridge University Press.